New Worksaver Model 924H Hydraulic Post Hole Digger for Skisteers & Front End Loaders with the "New Universal Skidsteer Quick Attach. 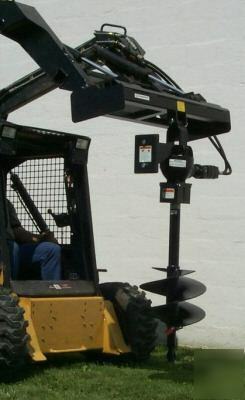 * Price includes Base Unit with Hydraulic Motor, a 12"x42" Auger, Hydraulic Hoses & Flat-Face Quick Couplers. * Rated for hydraulic systems between 10-20 GPM Hydraulic Flow. * Base Unit has a 1 Year Warranty, a 5 Year Warranty on the Gearbox and a 2 Year Warranty on the Hydraulic Motor. * Weight including the auger is 300lbs. * We are glad to say Worksaver Post Hole Diggers are Made In The USA!! !